Showing 1 - 10 of 40. I am once again writing about my garden each month. You'll get to see the good and the bad, after all gardening is a different adventure every year. Chartreuse has a unique way of brightening up the landscape anywhere you plant it, in sun or shade. Here are ten of our very best chartreuse annuals, perennials and shrubs to make your garden glow. Ready to grow a gorgeous garden? Start with these top award-winning annuals, perennials and shrubs which are ready to flourish in your containers and landscape. Some colors can be found in abundance in the landscape, but blue often isn’t one of them. Yet gardeners tell us it is one of their most favorite colors, so we’re always seeking out reliable perennials that are worthy of the Proven Winners name. Here are ten we think are definitely worth finding a place for in your landscape. To ensure only the top performing perennials are put into the Proven Winners brand, each variety is trialed extensively. 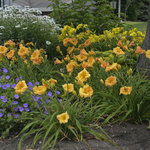 Like all Proven Winners perennials, the Paint the Town Dianthus series was tested alongside market standards at a range of testing sites in a variety of zones. These perennials are not only trialed in containers, but in ground as well to ensure winter hardiness and performance for many seasons. Have you ever wondered how plants get their names? We’ll let you in on a little behind-the-scenes action here at Proven Winners and tell you how a few of our favorites were named. Tired of growing the same few plants every year in your shade garden? Here are ten new ideas to help you brighten up your space with showy blooms and fantastic foliage. Purple is the new neutral in the gardening world. It goes with just about any other color you pair it with, from contrasting oranges to complementary pinks and greens. The descriptors “blue” and “purple” are used loosely when it comes to flowers and plants; they describe a whole range of these cool tones. Check out this list of ten varieties we think you’ll love for your garden. Clay soil—for many it presents a real challenge in the garden. Though there are lots of ways to improve its texture and drainage, make it easy on yourself and choose to grow plants that naturally thrive in clay soils. Here’s a closer look at ten perennials for clay, shown in order of their bloom times.